Cross the Umbro Marchigiana and Marchigiana ridge, a section of the Appennini Mountains running from north-west to south-east across central Italy. The path you follow is close to the tracks of the Romans and ancient connections between the villages and towns. You will encounter Roman ruins as well as Abbeys and Medieval towns, before finishing amid the full flowering of the Renaissance in fabulous Urbino. Cross the Umbro Marchigiana and Marchigiana ridge, a section of the Appennini Mountains running from north-west to south-east across central Italy. The path you follow is close to the tracks of the Romans and the ancient links between villages and towns. You will encounter Roman ruins as well as Abbeys and Medieval towns, before finding yourself amid the full flower of the Renaissance in Urbino.The best period for this journey is from April to October.The route is in five stages: the first two are a little bit harder; the three others are easier. Transfer to Fonte Avellana (45 mins. ), visit the abbey and walk Fonte Avellana – Cantiano (17,8km – h 7 without stops). Fonte Avellana is one of the most beautiful places in all the Appennines. From the abbey, walk the Sentiero Italia (http://it.wikipedia.org/wiki/Sentiero_Italia) rising to Monte Catria, and then crossing from east to west through a pass between Monte Catria and Monte Acuto (1450 mt). The climb is sometimes vigorous, but the view over the abbey and the splendid scenery is really unforgettable. The first leg ends in Cantiano, a small but important village, built by the Romans in a strategic position on the Via Flaminia. The second day takes you to Monte Tenetra, crossing the beautiful Tenetra grassland and two protected areas, where, especially in spring, you can see flowering orchids and many other species of wild flowers. After a splendid beech forest, you meet the Sentiero Frassati (http://www.sentierifrassati.org/home.html) and you will follow this path until the town of Cagli. Dinner not included tonight. Today the route runs parallel to the Via Flaminia, on its way towards the Furlo Gorge. During the day you will pass through Acqualagna, a small town famous all over the world for its truffles. Walk through the Furlo Gorge, and its surrounding countryside, a place full of history and beauty. After passing through the Roman tunnel, build in 77 AD, commence the climb towards Monte Pietralata, on the northern side of the gorge. From the top, looking south, the view over the gorge is astonishing, whilst to the north you descry Urbino’s majestic skyline. The fifth and last leg is a relaxing walk across the hills, heading directly for the Ducal Town. 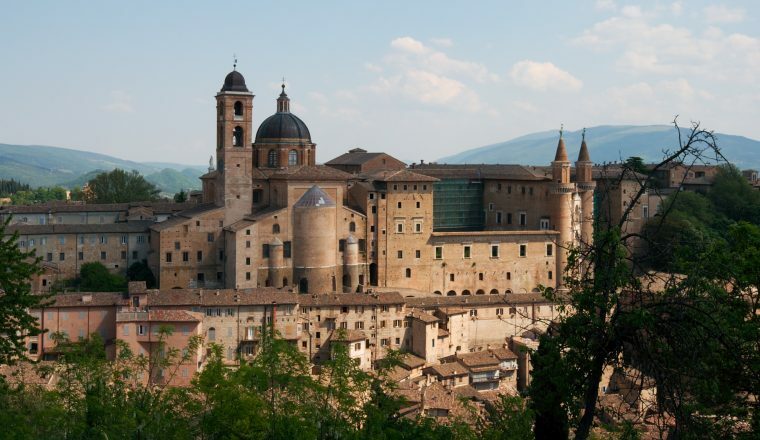 Pass through the village of Fermignano and then up to Urbino, where the massive Ducal Palace dominates the skyline. Enter Urbino directly into the heart of the town, arriving from south and entering through the ancient city walls. A full day to enjoy the magnificent Ducal Palace, the scene for Il Cortegiano (The Courtier), the classic handbook for the Renaissance man.